Locally owned and operated heating and air conditioning services, New England Air Systems LLC has been dedicated for more than 25 years in providing top quality HVAC services to Fairfield County. We arrive at each job prepared to exceed your expectations through professionalism, customer service, and quality service and repairs. We are reliable and convenient, offering only the best products and workmanship. Give us a call at (203) 798-9375 today to get started. All HVAC equipment requires service, just like your car. For the best comfort in your home, you need to trust the experts to keep your equipment running at peak efficiency. That is exactly what New England Air Systems LLC is here to do. Our technicians are licensed, insured, and professionally trained. We’ll make sure that you and your system get the personalized service you deserve. Best of all, we do it all. There’s no reason to call any other HVAC company. When looking for the best in central air conditioning and heating service, there is only one company to choose. 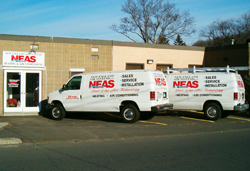 New England Air Systems offers quality heating repair and air conditioning services to the Fairfield County area. Call us today at (203) 798-9375 for service or a free estimate on a replacement!